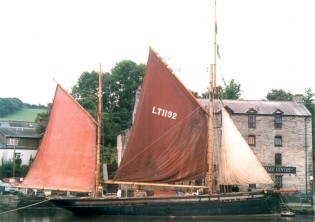 Believed to be the only surviving Rye-built sailing smack, KEEWAYDIN was launched in 1913 by G & T Smith, of Rye, for Lowestoft owners, and registered with the number LT 1192. She was built of carvel oak planking on oak frames, and her design and rig was based on the Brixham sailing trawler. 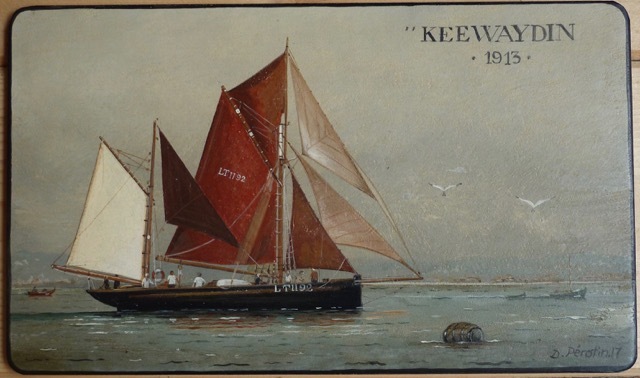 KEEWAYDIN fished out of Lowestoft on the North Sea banks until 1937. She then went to Denmark and later Sweden for coastal cargo carrying, with a 60 hp Bolander oil engine installed; she was renamed Vastenwind in 1944. During the Second World War she also carried refugees from Denmark to neutral Sweden and on one trip carried a total of 420 commandos. She was also believed to have been involved in gun running. In 1963 she was converted into a yacht and in 1973 was entered into the first Whitbread Round the World Yacht Race, and completed the circumnavigation. In 1974 she went to the Greek islands as a charter yacht and her rig was altered to two Bermudan sails. In 1985 she was renamed Odysseus. In 1989 she was bought by Adrian Amos, renamed Alice A, and went to Malta for major repairs. Later Amos renamed her Keewaydin again. In August 1997 she was bought by her present owners at Malta after the previous owner’s restoration project had failed. 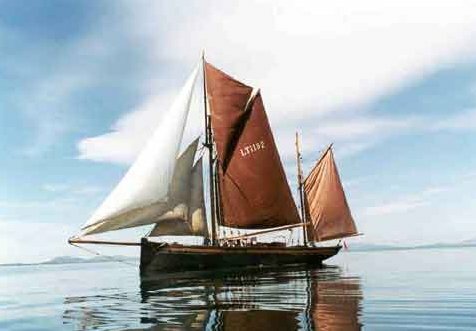 She was sailed to Brixham in 1998 where her restoration to the original gaff rig was finally completed. In 2001 KEEWAYDIN sailed again as a charter and holiday yacht based at Cardigan, west Wales, and sleeping twelve guests. She was damaged in September 2005 when on charter to a London sailing school using their own crew. An eighteen month rebuild followed, repairing the counter and starboard side. She was then mostly employed taking disadvantaged Carmarthenshire children to sea for adventure training. In 2008 her base became Falmouth, Cornwall which opened up opportunities for holiday voyages to the Scillies, Brittany, and beyond. In 2011 a new mainmast was stepped. At about midnight on 1/2 June 2011 KEEWAYDIN ran aground on an outcrop between the Scilly islands of Tresco and Bryher. The fourteen people on board were taken from the vessel to the shore by a local boat. The crew and a fire and rescue service crew from the island used a pump to keep the boat afloat overnight, and after about six hours she was refloated on the high tide and beached on Bryher for repairs. 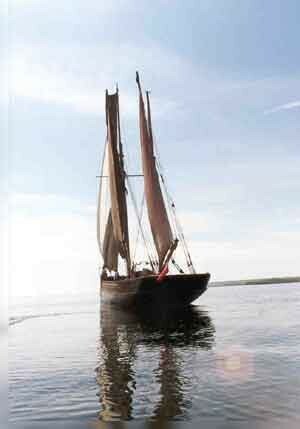 Source: Historic Sail, Britain's surviving working craft, Paul Brown, the History Press.